Welcome to October's Flowers on First! 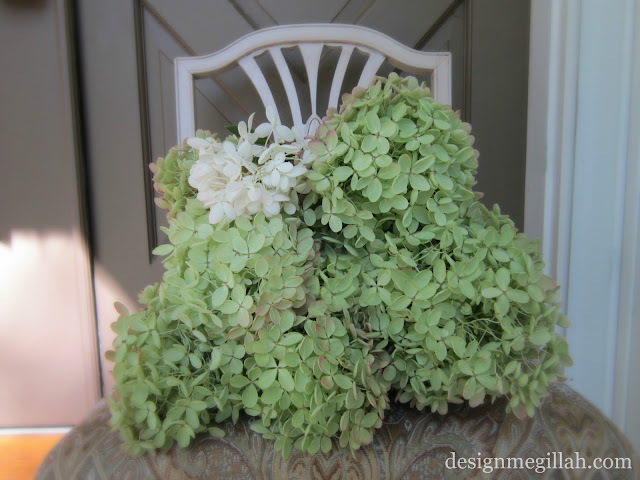 Although many varieties of Hydrangeas are in bloom most of the summer, my favorite Hydrangeas bloom in late summer into autumn--the Paniculata Hydrangeas. They are lush and plentiful all around the Northeast so I love to cut large bunches and place them all around the house. When Ariel had her October Bat Mitzvah (SO many years ago!) I made centerpieces for each table with nothing more than these beautiful flowers in simple white urns. In my Garden Gazebo sukkah I used bunches of dried Hydrangeas hung upside down from the schach (roof). Hydrangeas can easily be dried to enjoy all year round--simply strip off the leaves, arrange in a vase with or without water and leave them to dry. When they first bloom in August the flowers are white. By September the are turning green and then pink. 1. Immediately after cutting, plunge the cut end for about 30 seconds into boiling water. 2. 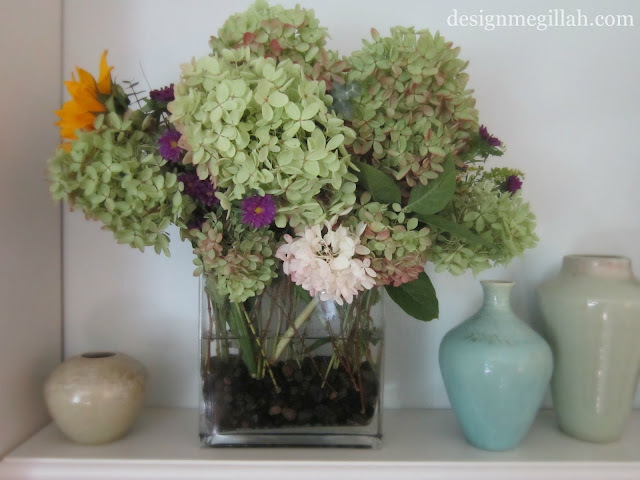 Put the hydrangeas into a deep container and fill with cool water all the way up to just below the flowers. 3. Mist the blooms, cover them with damp paper towels, and let them sit for 4 or 5 hours. The hydrangeas are now ready to use and should last a long time.